After a first-round bye, the varsity baseball team earned a 6-0 win over Pingry in the second round of the Somerset County Tournament on Saturday. On the mound, left-hander Cameron Miller '17 pitched a complete game shutout, scattering only four hits and one walk, while striking out seven. 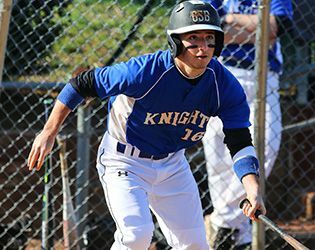 Dan Sivolella '16 (2-for-3) opened the scoring with an RBI double in the second inning and the Knights scored two more in the fourth on doubles by Matt Taylor '16 (2-for-3) and Ryan Chestnutt '16 and a triple from George Stiuso '16 (2-for-2). A.J. Donofrio '19 capped off the scoring with a two-run single in the sixth. On May 7, the Knights will travel to top-seeded Watchung Hills for a 2:00 game in the SCT quarterfinals.